I wear a size 11.5 boot so I felt like I was right on the cusp of needing a wide. Glad I got a wide because I have no toe or heel drag and the extra width is hardly noticeable in terms of performance reduction. The Performance Speaks For Itself! 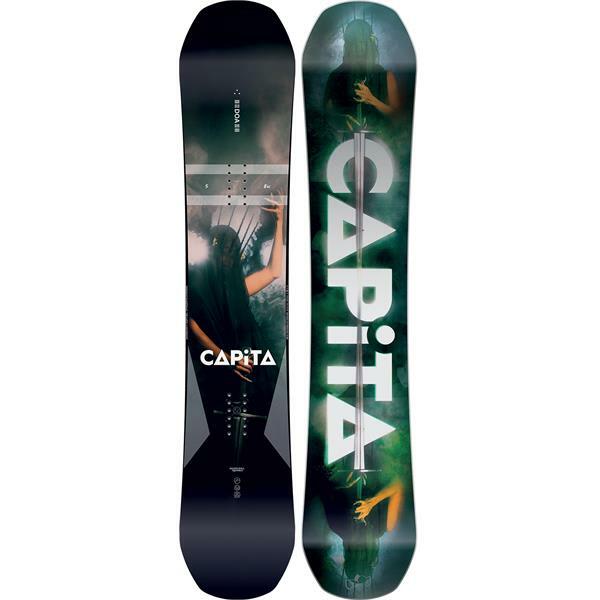 I’ve become a huge fan of CAPiTA boards after this purchase. Very pleased. I finally got a chance to ride my 161w for a couple days to see what it’s about. I ride in southern Idaho (Bogus and brundage). Coming from a 159w directional twin this new Capita is a bit different. I am 6’3” 210 lbs and I’ve always had my bindings with a bit of a set back. This DOA only allows to be set up pretty much middle of the board with very little set back. While it is still a pretty fun board and I had a great time riding it, I felt kinda nose/top heavy with my front foot being that close to the front of the board. Has a awesome amount of POP to it which is cool. We recently have been blessed with a lot of powder which I was lucky enough to ride mid week, this board got through it but it’s def not its strong point. This board tore it up more on the groomers with cat traverse/ side hits than anything else. I ordered a 154 that said it was on back order. Are these boards still coming in or should I ask for a refund? BEST ANSWER: I just received my 155 board today. I ordered my board in August. I think you will have your board very soon. I have called to different venders and no one had the Capita boards yet because of production issues. The DOA board is well worth the wait, it's amazing. Are these boards legit? Or does the house ask the company to make the product cheaper so they could sell them cheaper like Walmart? We do not sell any fraudulent products. This snowboard comes directly from the Capita Mothership. The reason a lot of our past season's stuff is on such a good sale is that we buy a lot of closeout items at a low price from the manufacturers. Since we sometimes save so much in buying the products, we pass the savings on to people like you! Will this board be restocked this season in 158W or 161W? Is there any downside to a wide board vs a regular? How big of a difference does it make. BEST ANSWER: A wide board will give you a little bit more stability with a slight decrease in that edge to edge to response seeing that you have to move a larger board under your feet. I prefer a wide board because I wear a size 12 boot and it helps keep more of my boot on the board. The difference isn't much but it can be used advantageously. The posted answers are great. If you have boots 11.5 or larger, a Wide board is a great option. A Wide board however can be a little stiffer, heavier, and possibly a tic less responsive. As a result, If your boots are 11 or smaller.... get a standard snowboard. I got the wide board mainly to fit my bootsize so my feet do not hang over the side. Obviously the wide helps as well in deeper powder. BEST ANSWER: With a size 12 boot it'd be a good idea to ride a board with a 25.8cm or wider. Have you considered riding the 155cm DOA Wide? I considered the 161. I realize 155 would be earlier to monuver but I free ride more than anything so would prefer more stability. When it comes to this board is it better to get a longer board or shorter board size? BEST ANSWER: For freestyle you can do a little shorter, and for all mountain riding go a little longer. If you do a bit of both stay in the middle. What is the V2 profile? BEST ANSWER: Taken from Capita's website, "Our ALL-TERRAIN V2 Profile boards take full advantage of the benefits of traditional camber, zero camber, and reverse camber. This next generation design allows you to get the pop and response of a cambered board with all the predictability and easy turn initiation of zero camber or reverse camber shapes." Im 6’2” 200lbs and wear a size 11 boot. Im thinking the 161 will be best for my height and weight, do you recommend getting a wide board for my boot size and large bindings? Hi I'm new to snowboarding and thinking about getting this board. I'm am 5'11 and my shoes size is 12.what size do I get? Overall, I would go with the 155 if you fit in the size range. The shorter boards are easier to maneuver, do tricks, and learn on, and longer boards do better at high speeds and in powder. Can I ride 155 w I’m 185 10.5 boots? Yes, the 155cm in the Capita DOA Wide would be a good choice for you if you are looking for a park board.